Live in St. Louis, MO, from Newark, NJ. Spaghetti and meatballs before, bagel with some peanut butter on race day morning, oranges, Gu raspberry, Gatorade and bananas during, and pizza after! Here’s a few: 1) In memory of my Mom who passed away way too early – and never saw me run. 2) Personal satisfaction in achieving goals. 3) Stress relief. 4) Love to eat! 5) Don’t enjoy cycling/spinning/swimming/weight-training, etc. 6) Stay healthy. 7) Enjoy visiting new places, while meeting different people. 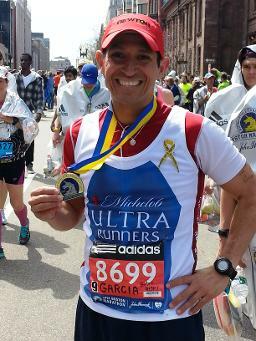 Running the 2014 Boston Marathon. The spectators and course volunteers brought their world-class A-game. I will be forever grateful that I had an opportunity to take part in such a great Boston-Strong event. I enjoy helping others accomplish their goals. Pacing also allows me to enjoy the crowds and the overall experience. Pacing my brother on his first marathon (2011). I also enjoyed pacing the 4:20 group, finished at 4:19:58, particularly a member of my pace group that at mile 7 told me that she “would love to finish with you and set a PR but that would be impossible” …she ended up crossing the finish line in front of me…new PR! I enjoy providing my group the motivation and important distraction so that they will achieve their goals. 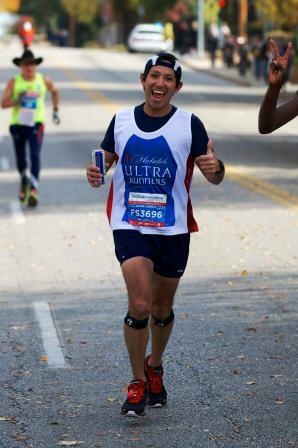 I love to have fun & provide encouragement along the course, while also providing advice that I've learned from past marathon experiences. I promise I will do everything in my power to get you across that finish line! 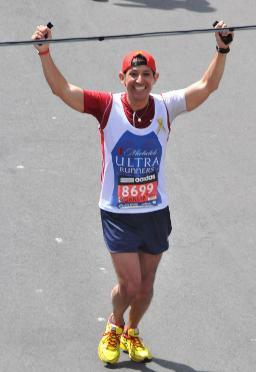 Smile during the run and truly enjoy the experience. On race morning, have the right attitude, don’t do anything you didn’t do during your training, trust in your training, relax, and have fun! Be confident. Stay focused. Run smart. When I race, I always make sure to thank the RD and all the volunteers. I also like to give back to the running community by becoming a volunteer myself. Volunteering at races is a great opportunity to learn more about our sport and meet new people.